Two of my favorite Japanese painters are Soga Shohaku(1730-1781) and Ito Jakuchu(1716-1800). Contemporaries, their paintings are very different from each other but share an extraordinary dynamism and ecstatic eccentricity that lands them solidly in my Hall Of Fame. My taste often runs to a more quiet austerity, but I find these two artists’ work so extraordinary that my usual preferences are squashed. I think at times one ought to resist a type of minimalist snobbery. Many of Ito Jakuchu’s paintings are of plants and animals in extraordinary landscape settings. Soga Shohaku’s work is more often concerned with various supernatural beings from Japanese mythology set in fantastic environs. A web-search will reveal a fair bit. A series of fortuitous events involving these two artists unfolded for me in 2011 in Kyoto. I went to the Kyoto National Museum searching for a catalogue of an exhibition of Shohaku’s work held in 2004.They had a copy of the Shohaku catalogue and some lovely postcards. Also, in my browsing I found a small book on Ito Jakuchu in which there was a fantastic painting of a temple and a photograph of the actual temple garden at Sekihoji that the painting represented(4th photo below). I asked the cashier if she knew where Sekihoji was and she said it was just three train stops south of the museum! I had been prepared to travel a lot further than this to see a temple that Jakuchu deemed worth painting. I made my way to Sekihoji which was only a few blocks walk from the train station in a quiet neighborhood. I paid my 300 Yen, gathered the usual complement of descriptive brochures and began my look-around without reading them, which I usually do first. I was very impressed with the entry gates to the temple and garden. Instead of the usual wood structures these gates were stucco painted a rosy pink. 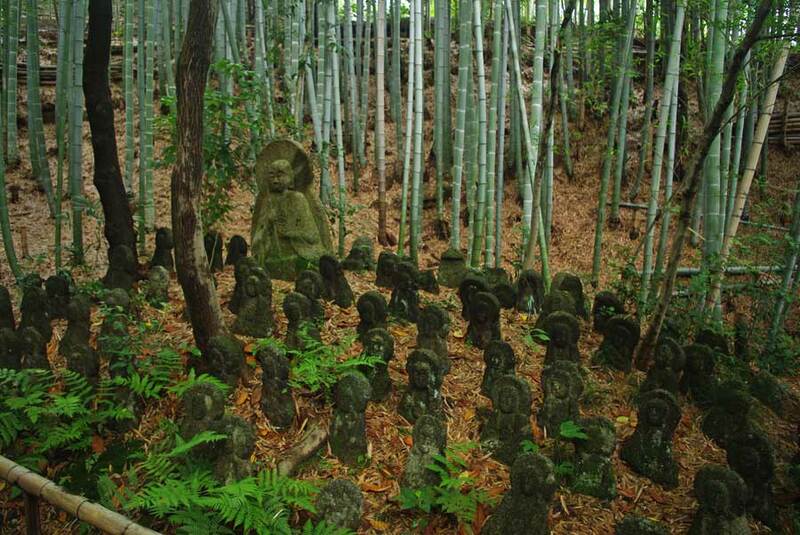 They struck me very strongly as portals of entry to another world, an impression that held as I walked the trails amidst bamboo and many carved and weathered stone Buddha sculptures set amongst the bamboo. It was a lovely experience with few other people there and I made my way back to the train. 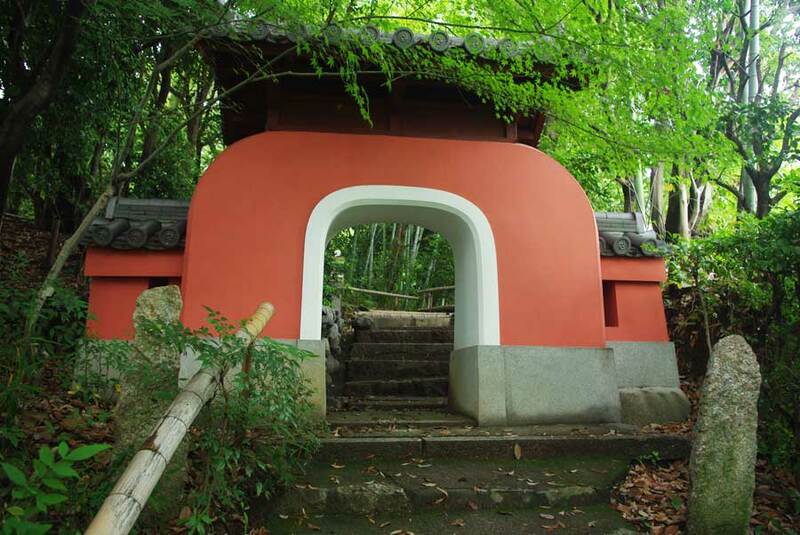 Sitting in the train I read the English description of the temple and discovered that not only did Jakuchu paint this temple garden, he designed it, lived at the temple the last ten years of his life and his grave-site is there! There was something oddly touching to me about reading this on the train after having left the temple. Also I was moved by the unusual series of events, setting out searching for the book of Shohaku’s work and ending with me being drawn to Sekihoji which was infused with the spirit of Ito Jakuchu. I have no idea if they were rivals in their time, as I know can happen, but in my mind they stand as equals in stature. 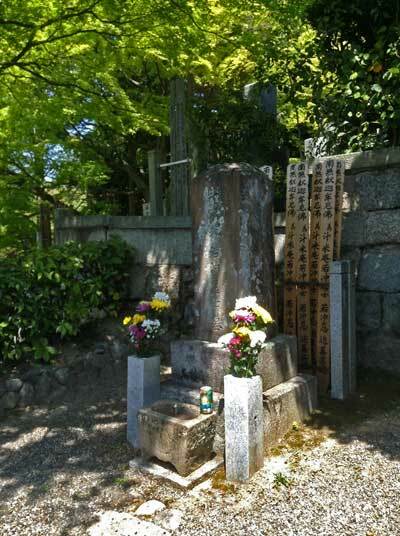 I returned to Sekihoji in 2013 and took a photo of Jakuchu’s gravesite. Why is it that winter appeals to some so deeply and others loathe it? It does seem we line up in camps around temperature. It is possible to be quite comfortable with proper clothing, in temperatures around 10-20 F which most people would, I suppose, consider quite unbearable. The beauties of the aftermath are there for those with eyes. I rarely see anyone out seeking these sorts of rare sights. Go figure. These shots are from this year and some past. Beauty is where you find it. This is a restoration of an earlier post. The first paragraph and first photo are new. Damien was up for Thanksgiving and we had our usual fine time with lots of conversation ranging from shop-talk to the Simpson’s and much comparing of Australian culture to American(good for more than a few laughs). He brought along a case -full of marvelous tools he had made for an antique pistol set(see ball-mold below). It’s extremely difficult to appreciate the time and attention to detail involved in making a set of tools such as these. In the ball-mold for example note the pleasing curve and taper of the handle and thumb lever, as well as the generally pleasing proportions and finishing touches. In any field there comes along a practitioner every decade or three who stands out. Someone who’s inborn talent cannot be denied but who has achieved a level of accomplishment because of passion, hard work and sacrifice. Their work exhibits mastery of certain standards in the field but also a flair for innovation and imagination. In the spring of 2012 I had the pleasure to meet Damien Connolly who fits the above. We had met online a year or so earlier on Sam Alfano’s engraving forum. By-the-way Sam is another engraving master, a term that I do not use lightly. Damien had mentioned he was moving to Vermont from Australia and I suggested he get in touch when the dust settled. He did get in touch and I’d say we hit it off which is not always a given in the small realm which we inhabit. Damien will be embarrassed if I litanize his mastery of many diverse skills, so I will largely let the photos below do the talking. I should mention that far from being a master of engraving, he is capable of making a gun from scratch as has been done on the miniature shown(name) which is fully functional. This includes the wood stock-making and attendant carving. I have not seen anything like the carving on the Colt grip. Damien has settled a few minutes from his friend, master engraver Winston Churchill who was very helpful in facilitating the move from Australia. It would be hard to imagine a better advocate than Winston in making such a daunting move. He is a legend in the engraving world, recognized as the premier American firearms engraver for more than four decades. Winston was very inspirational to me in my early engraving years in the 70s, and I was very happy to be invited down to visit Damien and Winston, who I haven’t seen in a number of years. We had a splendid time sharing work, talking shop and swapping lies. Also I should point out that often mastery of the technical does not necessarily mean there will be a corresponding sensitivity to forms in the natural world. In Damien’s case, however this seems to be abundantly part of the package as seen in the Water-Buffalo and the drawn design of a fox and kits. We may have to kill him!! Among the highlights of all my trips to Japan was the opportunity June 2011 to see an exhibition of metalwork of many, many of the great metal artists from the Meiji period at the Okayama Prefectural Museum in Okayama, including works of Shoami Katsuyoshi, Unno Shomin and Kano Natsuo. Most of these works were from the Kiyomizu-Sannenzaka Museum. In addition, the Okayama Pref. Museum’s collection includes many of the finest works of Shoami Katsuyoshi as he lived and worked for years in Okayama and is buried there. Murata Masayuki, director of the Sannenzaka Museum escorted me to Okayama to view the exhibition. He and I had travelled to the same museum in 2008 but it was closed for some unforeseen reason. At that time we were also going to ask the museum people where Shoami Kasuyoshi’s grave-site was, but obviously it didn’t happen. This time we were welcomed by the museum director, Tamura Keisuke. We had a very enjoyable time visiting with Tamura-san and he had independently asked Murata-san if we wanted to visit Katsuyoshi-sensei’s grave-site! Another unexpected joy was the inclusion in the exhibit of some tools of Shoami Katsuyoshi, a few unfinished works that were in process when he died, and a design drawing folio. Afterward Murata-san told me he had discovered these when visiting Shoami Katsuyoshi’s granddaughters, still living in Tokyo. I was strongly affected by seeing these items, especially as I was not expecting to and they appeared by surprise as we rounded a corner. I was quite overwhelmed by viewing the tools, designs, unfinished works and the many, many masterpieces by the superb masters from that era. Murata-san, taking pity on my emotional state, kindly took me to tea after which we proceeded to Shoami Katsuyoshi’s grave, guided by Sato-san from the museum. Heavy rain broke out as soon as the car parked. It was a day I will not forget, filled with kindness, generosity, beauty and palpable humanity contained in a few simple tools, some unfinished works and a grave-site. This is a restoration of an earlier post. The piece is titled Unseen Hand Of Water. My aim with this work was to evoke the mystery around a narrative that has already passed. I had begun the carving before the tragic events in Tohoku, Japan, March 2011, and I was certainly struck with how water can reshape our lives as well as create tranquil beauty. I had many moments while making it to reflect on the quiet endurance of the Japanese people in the wake of the destructive Tsunami. During many quiet and restorative hours in Nature, I am fascinated with the ever-changing details of stream beds after high-water events such as spring run-off or a large rainfall. One of the phenomena that appeals to me in this regard is the shaping of sand-bars and the patterns left by water. Objects large and small, such as logs, stones and twigs come to rest in the sand, creating a small still-life, charged with the power of the water and the mystery of how objects came to their position. A stream-bed focuses several powerful visual and dynamic realities. In the short term, every visit unveils new courses of water, and new arrangements of sticks, stones, leavings and bits. In the longer run, the work of water for ages reveals rocks uplifted when North America and Africa collided as continents. I find it impossible to be emotionally unaffected by this display of transformation and beauty, both short and long-term. I hope the evocation of this work will involve the viewer with their own imaginative emotional response. In the wood I carved an undulating surface representing the sand patterns, and textured the surface to appear as sand. This texture was done with a triangular chisel point, moved in various angles so that the reflected light would dance as grains of sand might in the light. The stones are made from, iron, lead, two alloys of shibuichi and pure silver. The twig is made from shakudo with traces of gold.